← 142 "Scenes from the Class Struggle in Springfield"
"A professional in an ape mask is still a professional." "Bark the Fink" is the fifteenth episode of Season 7. It originally aired on February 11, 1996. The episode was written by John Swartzwelder (the original story was written by Bob Kushell) and was directed by Jim Reardon. 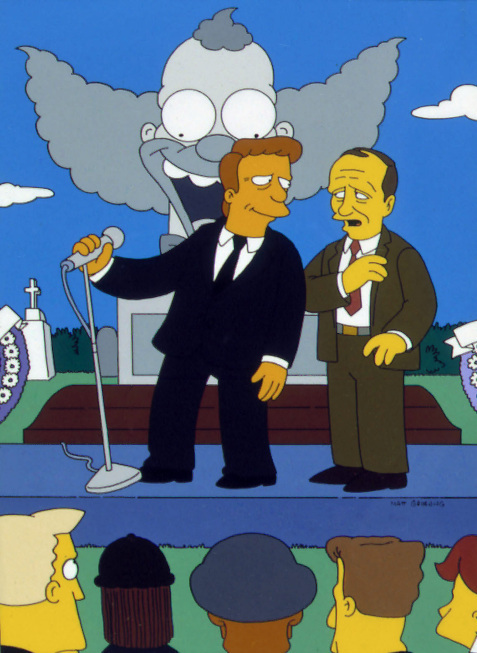 Bob Newhart guest stars as himself and Phil Hartman returns to voice Troy McClure. "When Bart accidentally finks on him to the IRS, Krusty the Clown decides to go for that last plane ride." After Homer and the family inherit some money from his late Great Aunt Hortense, Marge asks the kids what they want to spend their money on. However, when Bart intends to take advantage of a Tacomat deal (100 tacos for $100) and Lisa says she'll contribute her inheritance to the Corporation for Public Broadcasting, Marge puts her foot down and forces them to put their money in a bank account. Bart gets a checkbook that links into his account and starts writing checks to people, and in hopes of getting Krusty the Clown's signature, slips a check into his pocket. When his monthly bank statement comes in, he is upset to find that Krusty has neglected to sign the check, and instead the stamp of a holding company is present. To pay for his tax evasion, Krusty's salary will be reduced drastically. The repayment eats into all corners of his empire. 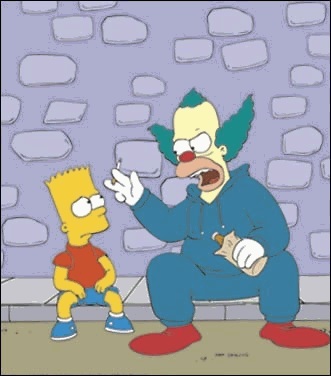 The Krusty the Clown Show is scaled back drastically (no money exists in the budget for props, costumes or Sideshow Mel), the IRS takes over ownership of the Krusty Burger chain, and Krusty's valuables are auctioned off. Shortly afterward, Krusty is seen flying his private plane erratically, causing it to crash. When no remains are found, Krusty is declared dead. Bart is wracked with guilt, feeling terrible that he brought on the death of his idol. However, over the next couple of days, Bart is shocked when he sees a man looking suspiciously like Krusty. With Lisa's help, they soon find out that Krusty had faked his death, and assumed the new identity of Rory B. Bellows. Confronting him at the Springfield Docks, Krusty claims he is happy being a salvager, but Bart and Lisa convince him otherwise. Krusty decides to give up his new life, and assures the two that with the life insurance from his identity of Rory Bellows, he should be able to pay off the government (he then blows up the boat they have just left). Wikisimpsons has a collection of images related to "Bart the Fink". Modified on February 24, 2019, at 18:37.